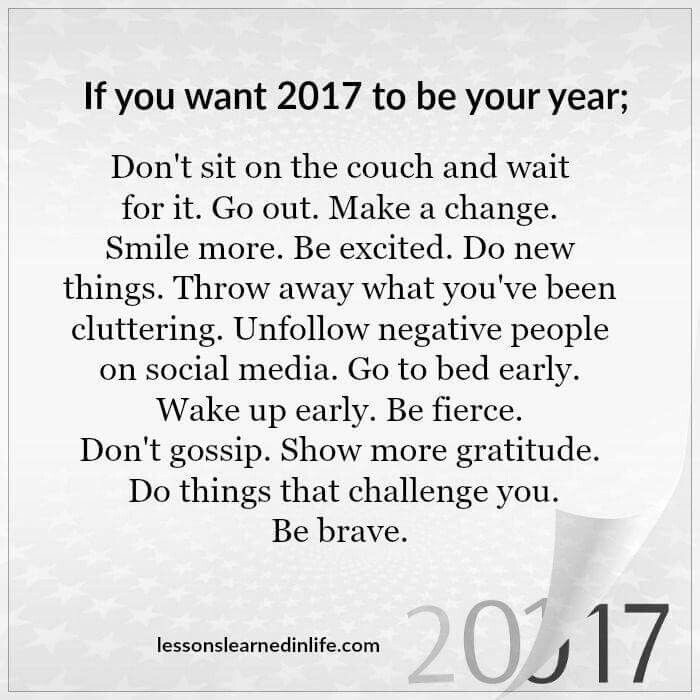 If you want 2017 to be your year: Don’t sit on the couch and wait for it. Go out. Make a change. Smile more. Be excited. Do new things. Throw away what you’ve been cluttering. Unfollow negative people on social media. Go to be early. Wake up early. Be fierce. Don’t gossip. Show more gratitude. Do things that challenge you. Be brave. I LOVE this!! How many of us say that the upcoming New Year is going to be their year? Well, I think majority of us have said at some point (around 12:00am on Dec 31st whether 20xx or 19xx),”THIS IS going to be my year!” I will admit… I think I say something similar to this each year, but often pointed around something specific, like “this year I’m going to get in shape”… or …” this year I am going to plan that trip I’ve been wanting to go on”… etc etc etc. I think New Years Resolutions are like any goal you set, you have to be committed and really want it for it to happen. The calendar change to an entire new year, and saying goodbye to another, is certainly the push to help motivate change, but you still need to have your mind set to it and put in effort. While we still have 10 days until we begin the 10 second countdown, maybe take the time to consider what (if anything) you really want to achieve, do, accomplish, get rid of, in the next year! A brand new year truly offers the opportunity to make a change you’re looking for. Have a list of things? Write them out! Look over your list closely and take the time to decide what you really want and what you can put some motivation into! Saying you want to sign up for grad school, or join a new workout class is not going to work if you haven’t done school research or hate working out in public. To give yourself the opportunity to achieve your resolution, you need to be realistic about what you want to achieve. My plan for 2017 is above! 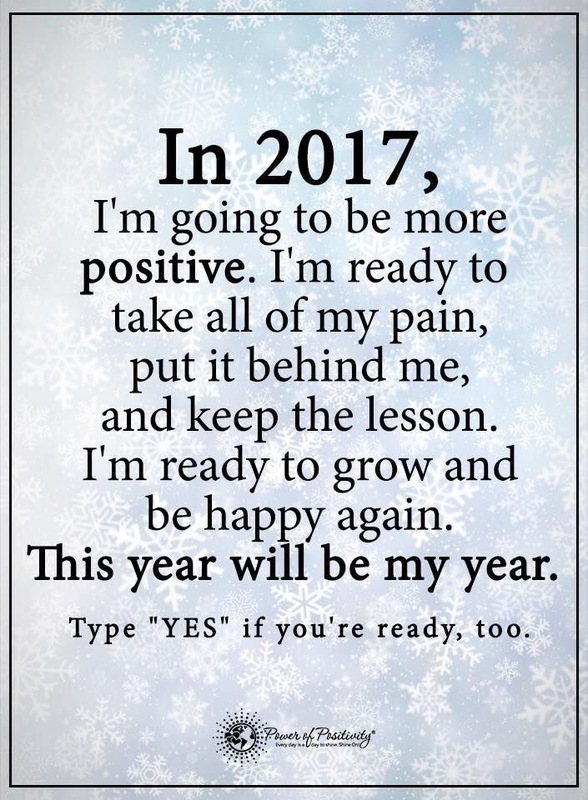 I vote for Positivity in 2017 and my first step is to say YES to being happy! If you are with me and like this idea too, write it out below!! !